By now, you’ve probably seen QR codes in many places. You may even have used them. They’re still fairly new. A QR code is a square image — usually black and white — that works something like a barcode that you see on products in a store. The code contains a link, usually to a URL. Then you use a QR reader app on a smart phone, which scans the QR code and displays the URL as a link, so you can visit the page. 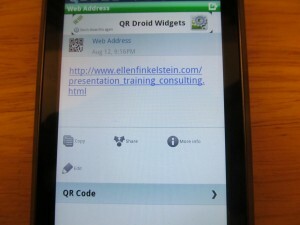 A QR code can also lead to text, a phone number or SMS (texting). Why would a presenter want a QR code? Do you put your website’s URL on your first and last slides? Email address? Twitter name? A QR code is just another way of letting people connect with you. A QR code is a connection between offline (your presentation) and online but it has a technological connection that text on your slide doesn’t have — people with a QR reader on their smart phone can capture your URL without having to write it down. The procedure is pretty simple. You may have a few options but basically you enter the URL and download the image. You can use that image anywhere. Here’s a QR code that I created with GoQR.me that links to my e-store. I set this one to be 200×200 pixels. Inserting a QR code on a slide is as simple as inserting a picture. Go to Insert> Picture and navigate to the file that you downloaded. You can resize the image if you want, but remember that it should be large enough so that people can scan it from their seat. I’m not aware of any specs regarding how large a QR code has to be, but when I stood 5 feet away from my monitor and scanned from this blog post, the app didn’t work. From 2-3 feet, I had no problem. Of course, your QR code will probably be projected on a screen that makes it larger. I would certainly test it from the back row before using it! Here’s an example of a QR code on a slide. This one links to my Training webpage. People in the audience need a QR scanning app. I used QR Droid, but there are many available. 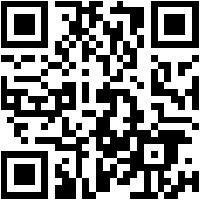 On a smart phone, you go to the App store and search for QR reader or QR scanner, then download the app of your choice. Once you have the app, you open it and it contains a thin line. To scan the QR code, you hold up the phone to the QR code and move the line across the image. Then, the URL that was set up appears on the screen. Here’s how it looks on my Droid 4. You can simply click the link to go to the webpage on your phone, but you can also share the link. For example, audience members might want to send the URL to themselves by e-mail so they can go to your webpage later. Either way, you succeeded in getting your audience to your website where they can find more information. Be sure to test your QR code before you use it! Do you have your own business? If so, I have a similar post but with more ideas for using QR codes here. Have you used a QR code on a slide? Do you think it would be useful? Well done! You could add polls and surveys. Do you mean link the QR code to a pool or survey? Or do you mean add a poll or survey to the presentation? Great idea, Ellen! I’ve found QR codes are especially useful in webinar settings since participants can hold their smartphones right up to the screen. That’s a cool idea; hadn’t thought of that. 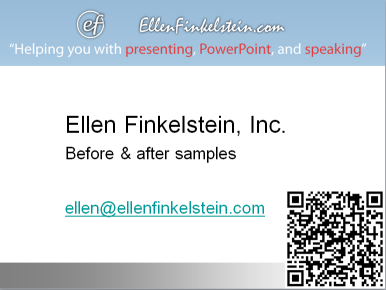 Most webinar services don’t let you create active links in the slides, so a QR code is a great way to get people to your site. Great idea! 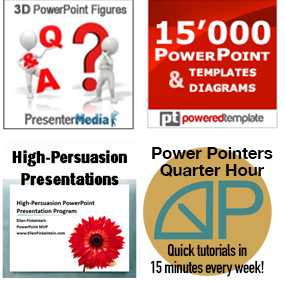 Love the thought of using it as part of the webinar process too! Hi Simon, glad to hear from you! I just did a conference t-shirt with a QR code that links to the conference website as part of the artwork. Jim, What a cool idea! The QR code was on the back, right? I’ve been using QR Codes to link to online resources in much of my training material that I hand to students, I also include a few basic notes about the resource in the code. It has been well received, especially with a younger audiences who all have smart phone devices.